About the Amish, Mennonites & the "Plain People"
Welcome to this overview of the Amish, the Mennonites, the Brethren, and the other “Plain People” of the Pennsylvania Dutch Country / Lancaster County, PA. The farmlands of the Pennsylvania Dutch Country are among the most productive in the nation. Many of the farmers here are different from most Americans – different by choice. They are the Amish and Mennonites, also known as the Plain People. An Amish farmer raking hay. Amish people have been using horses since the days when only horses made horsepower. 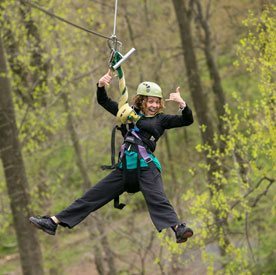 In comparison to our fast-paced society, the simpler, family-centered Amish culture holds a special fascination for many of us. The Amish trace their heritage back hundreds of years, and yet, despite all the time that has passed and the many changes that have taken place in society, they still live and work much as their forefathers did. For the Amish people, family, farm and faith are top priorities. The Amish are devout in their faith, believing in a literal interpretation and application of Scripture as the Word of God. They take seriously the Biblical commands to separate themselves from the things of the world. They believe worldliness can keep them from being close to God, and can introduce influences that could be destructive to their communities and to their way of life. Today, there are over 25 different Amish, Mennonite, and Brethren church groups in Lancaster County, all holding to slightly different traditions and their own interpretations of the Bible. The more traditional groups are called ‘old-order Amish.’ They do not permit electricity or telephones in their homes. By restricting access to television, radio, and telephones, the Amish are better able to keep the modern world from intruding into their lives. The Amish have long preferred farming as a way of life. They feel their lifestyle and their families can best be maintained in a rural environment. While they do not permit the use of tractors in their fields, old order Amish groups will use modern farm equipment pulled by teams of horses or mules. Old order groups do not own or operate automobiles, believing that cars would provide undesirable access to the ways of the world. You will often see their horses and buggies on our local roads. 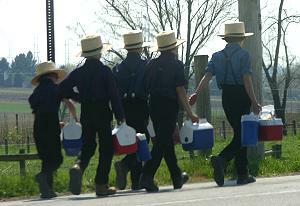 Amish boys walking to school. They wear plain clothing styles, which is why they’re called “Plain People.” It is the simple, peaceful lifestyle of these plain people that attracts such a curiosity today. Many wonder how the Plain People can survive in their supposedly backward ways. Well, they’re not only surviving – they’re thriving! Since 1960, the Amish population in Lancaster County has almost tripled. 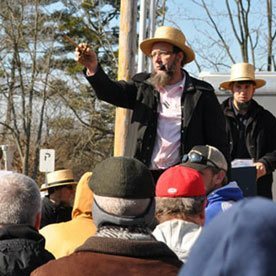 According to the Young Center for Anabaptist and Pietist Studies at Elizabethtown College, the Lancaster County Amish population is estimated to be 38,095 (as of 2018). Their separation from the rest of society actually helps to strengthen their community. Amish children attend one-room schoolhouses through the eighth grade. Amish worship services are held every other week in one of the members’ homes. Socializing is an important part of Amish life. The Amish have a strong sense of community spirit, and often come to the aid of those in need. Their barn raisings are a good example. Neighbors freely give of their time and their skills to help one another. And, of course, Amish women love making handmade quilts. Amish men who don’t farm typically end up working in the construction industry or make what’s become known as “Amish furniture” (which isn’t a style in itself, but simply any kind of furniture made by the Amish). The Amish people are generally private people and often find all the attention and curiosity about their lifestyle disturbing. They believe that the taking of photographs where someone is recognizable is forbidden by the Biblical prohibition against making any ‘graven image.’ Please respect their desire for privacy when on Amish Country tours. With our society’s current interest in restoring “family values,” much can be learned from studying the Amish way of life. Their devotion to family and community, and their strong work ethic are good examples for our society at large. Read more about the Amish People and their lifestyle. Read about the history of the Amish and the Mennonites. Read about the faith of the Amish. Read about Amish One-Room Schools. Read about the tragic Amish School Shooting. Learn about the Amish Forgiveness and Grace after the school shooting. 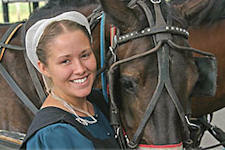 Visit Lancaster, PA to learn about the Amish first hand or book an Amish tour. 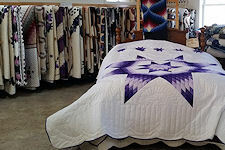 Learn more about Amish Furniture, Handmade Quilts, and other Amish-Made products. Learn more by watching an Amish program that was aired on PBS television.